I always thought it would be fun to live in a tree house and have tried to create that fantasy upstairs in the lodge. The second story rooms, finished in beautiful native woods, are located on the four corners of the lodge with the communal areas in the center. 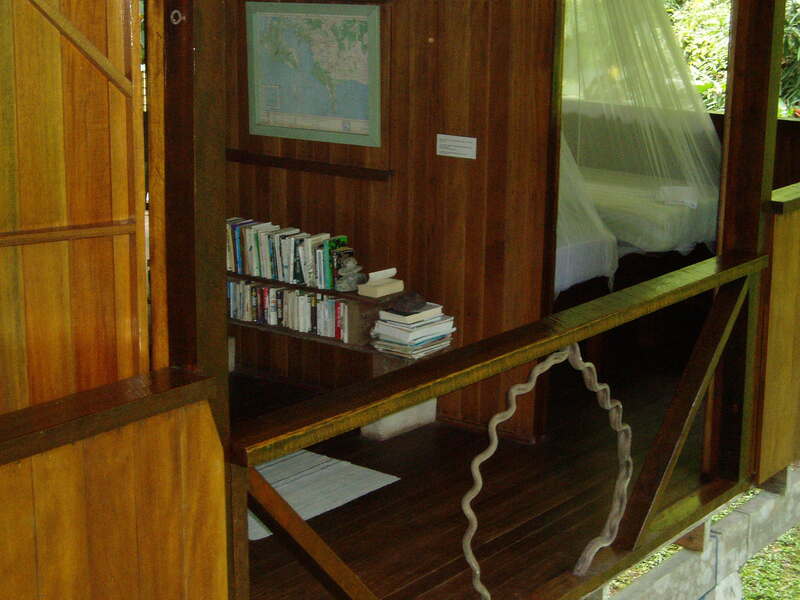 The rooms are open to the forest on two sides for air circulation and ease of wildlife viewing. 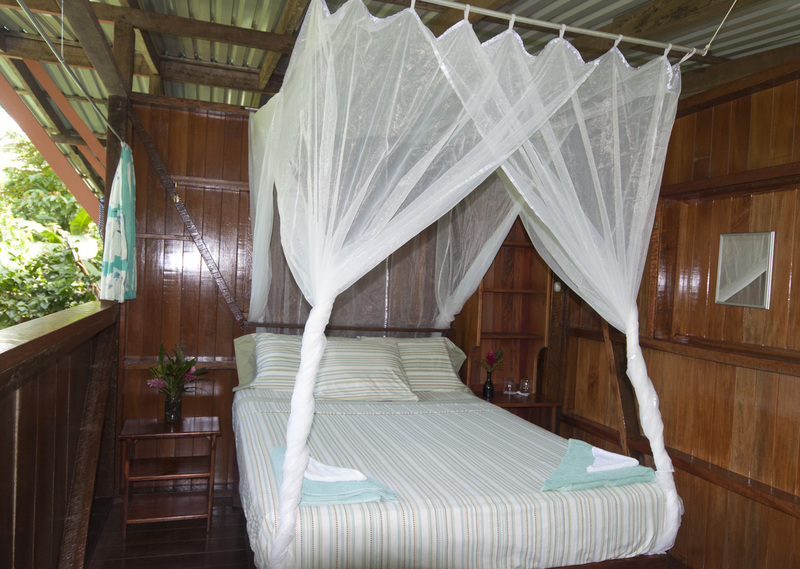 There are two shared bathrooms, one upstairs and one downstairs and the spacious garden showers are only a few meters from the lodge. There are two rooms with double beds. The beds are draped with generous, quality nets. We have two rooms with two twin beds, each. There are reading lights, personal soap dishes and plenty of hooks and shelves. 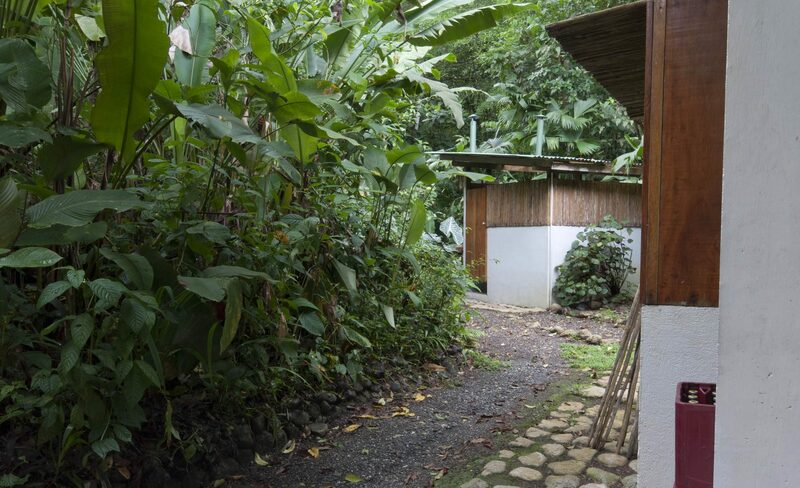 Many guests rave about our garden showers. There are two roomy showers, lights, mirrors, hooks, a chair, hot water and great water pressure. We are very grateful to previous guests for choosing our lodge. Your support has helped us protect this corner of the Osa Peninsula for many years, which is continuously threatened by unsustainable development and resource extraction. We would like to thank the following people for their photography, editing, and design for this site: Andrew Russell, Bill Madigan, Jeff Zuhlke, Mathias Csader, Michael Wickens, Scott Olmstead, and Ted Leather.